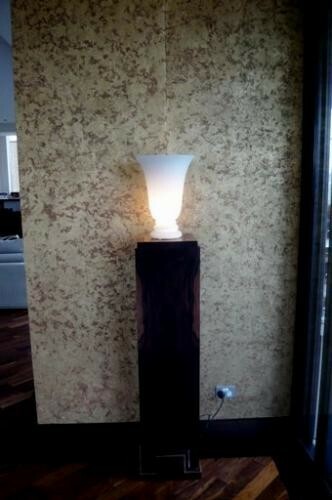 The pillar is in Macassar with nickel detail. Provision has been provided to run the cord through the centre of the pillar. The Torchier light is from France and is made of glass, it gives off a lovely soft muted glow, which enhances the beautiful bespoke wallpaper which is hand made in America and Japan with gold leaf.